Welcome to Betamaxcollecters.com. This site takes a look back on NTSC video history, the first home video recorders to ever hit the market. The Sony Betamax. Beta was the format that started it all. The format was introduced May, 10 1975 by Sony in a console with a built in Sony Trinitron television. 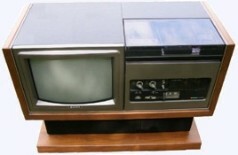 Sony's second model was a stand alone VCR. Soon after Toshiba, Sanyo, and a few other manufacturers soon produced there own line of Beta VCRS. Sanyo known as the Betacord VCRS. Zenith, Realistic, Sears also had there clones of the Sanyo and Sony Betamax VCR. Zenith called there Sony clones, The Video Director. The next year after Beta was introduced, in 1976 was when JVC introduced VHS. Throughout the late 70s up to the late 1980s was the Betamax Vs VHS battle. It was a long battle. 1984 was the year the sales of Beta VCRS were the highest. By 1986, VHS sales were well over the Beta format. That was the time when people knew Beta was going to die.1988 was the year Sony put out there first line of VHS VCRS. Sony continued to produce Beta VCRS up until 1993. Unfortunately Beta lost due to shorter tape hours, Beta cassettes are a bit smaller than VHS cassettes, VHS cassettes could spool more tape, which means more tape time. Consumers were after VHS due to longer tape recording time. The 1970s and early 1980s were the times when both formats loaded the cassettes on the top. It wasn't until 1981 when Sony introduced the first front loading machine, and 1983 the first Hi-Fi machine ever. VHS soon copied. Now we are in the days of DVD. VHS the longest going format is now pretty much obsolete.